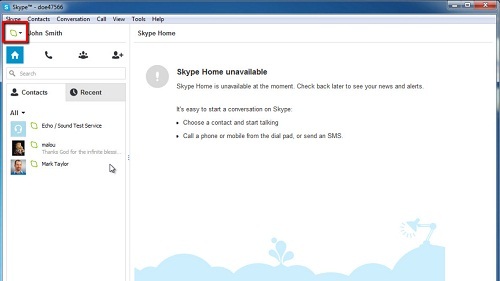 In this tutorial you are going to learn how to start Skype in the offline mode. Open Skype and sign in to your account. Click and hold the status symbol next to your Skype name. This symbol can be found in the title bar on the top left hand side of the Skype window that shows your Skype login name. A pop-up menu will appear showing all the different statuses possible. Your status defaults to “Online” when you sign in to Skype, a solid green bubble with a check mark in it. Change your status to “Offline” by selecting the “Offline” symbol in the pop-up menu. The status symbol changes to a white bubble with a pale green outline, visually confirming that you are “Offline”. Log out of Skype or quit the program. 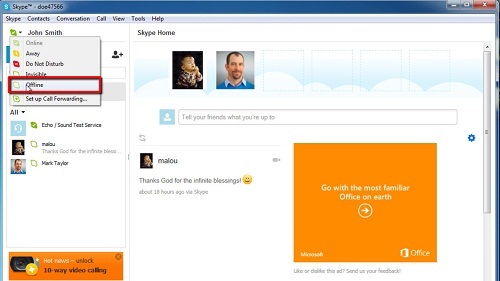 Open Skype again and sign back in to your Skype account. Your status is now set to “Offline” and will remain “Offline” until you change it. This is how to start Skype in offline mode.